Statement pieces are of course all about making a statement and that's exactly what this fabulous Glass Decanter Table Lamp With Natural Hessian Shade does. 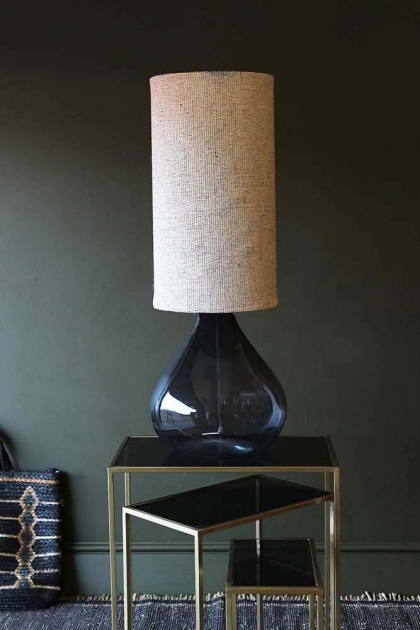 The glass lamp base has a smoked finish to the decanter style shape making it not only translucent to fit in with the surroundings, but is also a gorgeous surface for the light to reflect off of. The tall tubular shaped lamp shade is made from natural hessian and in the neutral colour, it combines effortlessly with the smokey glass lamp base. Set on a table in your living or dining room, the substantial size and impressive presence of this lamp means that it can't fail but attract attention.